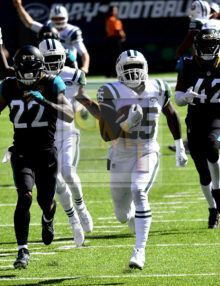 New York Jets rookie running back, ELIAJAH McGWIRE runs for a 69 yard touchdown in the third quarter as Jacksonville Jaguars cornerback (22) AARON COLVIN and safety(42) BARRY CHURCH attempt to catch him. 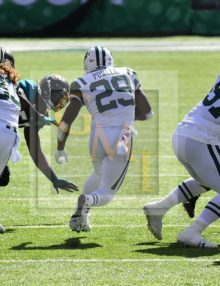 McGwire ran for 93yards overall, leading the Jets to a 20-23 victory. 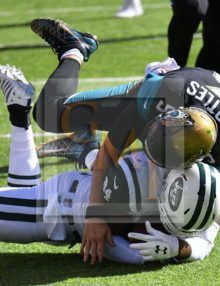 New York Jets running back, BILAL POWELL, finds a whole in the Jacksonville Jaguars defense leaping over a Jaguars linebacker and runs for a 75 yard touchdown in the first quarter without being touched. It was the longest touchdown run since Bruce Harper went 78 yards in 1983. 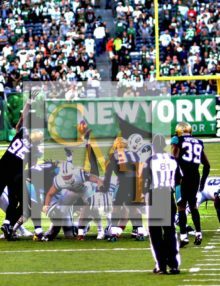 New York Jets kicker, CHANDLER CATANZARO, kicks a 41yard field goal with 28 seconds left in overtime to give the Jets a 23-20 victory over the Jacksonville Jaguars at MetLife Stadium. Catanzaro kicked a 45 yarder in the second quarter to tie the game at 10-10. 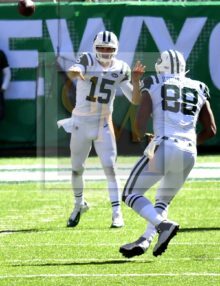 New York Jets quarterback, JOSH McCOWN completes a pass to running back Bilal Powell in the second quarter at MetLife Stadium. McCOWN completed 23 of 31 passes for 224 yards with one interception. The Jets went on to win 23-20 in overtime. 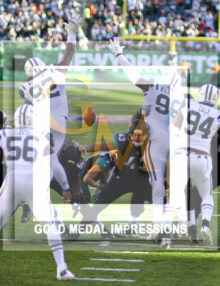 Jacksonville Jaguars kicker JASON MYERS kicks a 22 yard field goal with 46 seconds remaining sending the game into overtime with the game tied 20-20. The Jets went on to win 23-20 in overtime when Jets kicker Chandler Catanzaro kicked a 41 yard field goal with 28 seconds remaining in overtime.